Disclosure: As a photographic advisor to Light Crafts Inc. we are partly involved in the development of LightZone. Still what we write is our personal opinion and not the one of Light Crafts. 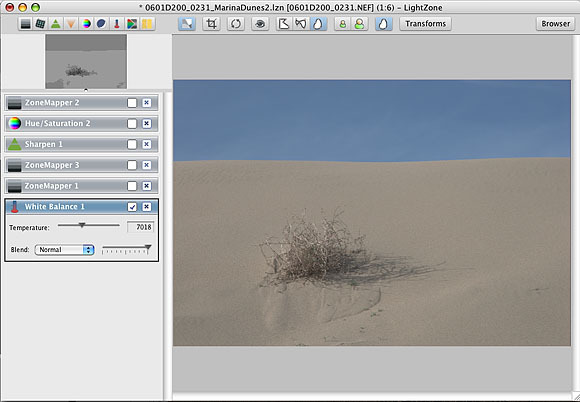 As this review will show LightZone is a new kind of photography editor. To better understand what we mean let's have a look at today's imaging tools. Imaging Editor: The best known tool of this kind is Photoshop. Photoshop is a top class imaging editor that also can be used for powerful photo manipulation. Photoshop has for years a strong focus on image designers and has many features that are not obvious to be useful for normal photographers. This also means that many photographers find Photoshop hard to master. 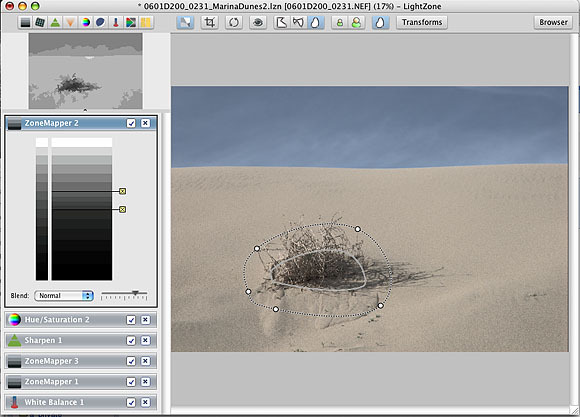 Still Photoshop is the reference image editor used for the photographic workflow. RAW Converter: Nearly all RAW converters lack features that would make them the tool of choice for editing RAW files ready for a final print. We will show in this article what their main lacking features are. This means in many cases the final image tuning has to be performed inside Photoshop (this is at least true for all of our work). Photo Editor: A photo editor is a tool that can bring in many cases a photo from the RAW/JPEG/TIFF camera (or scans) to the final printable version of this photo. LightZone is a tool of this kind. Note: Even the new tools like Aperture or Lightroom do not belong into this last category because they lack some essential selective editing capabilities. This does not mean that quite a few photographers may not require selective editing on many of their images. Dodge & Burn (making changes to selected areas of your photo. None of today's RAW converters helps here and normally only Photoshop layers with layer masks provide a solution. Note: LightZone 1.2 is still an early version of this product. The developers are aware that they need to add some essential features and they are working on this. The best way to learn LightZone is to show a real world sample session. LZ provides a basic image browsers. This browser has no ambitions to be a replacement for complete photo organizers like Apple Aperture or Adobe Lightroom. 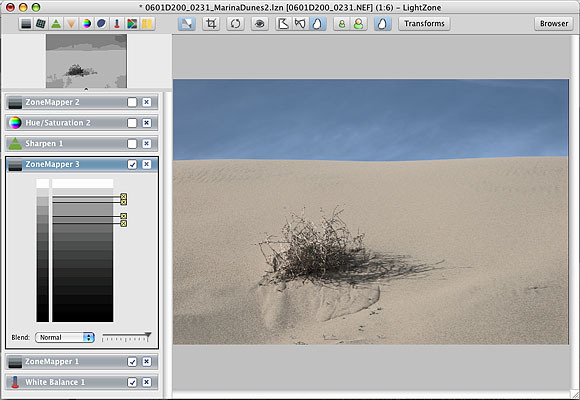 Instead LightZone tries to work well together with these tools. Right now the LZ white balance tool is a standard color temperature tool and does not have any tool to properly gray balance a photo. LightZone correctly recognizes the in-camera WB settings. We are also missing some WB presets (although in reality we hardly ever use them). The color cast tool allows to neutralize colors in a certain range of luminosity. This way you can neutralize differently in the shadows, midtones and highlights (This tool is new in V1.2). Because LZ allows all operations to operate only on regions (see below) it is easy to have different WB settings for different regions in your image. This is more often needed than you may think because many scenes are lit by different light sources (e.g. sun and sky). Tonality tuning is very different from all the other RAW converters that feature Levels and/or Curves tools. It is quite obvious that our sample photo lacks quite a bit of overall contrast. As in all other editors we first have to adjust the white/black points. 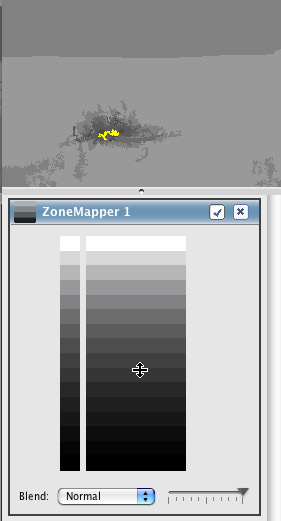 For this task LZ provides a so called ZoneMapper tool and ZoneFinder display. These tools are very new but not hard to master. 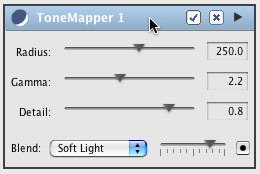 The ZoneMapper has 16 tone regions from black to white (like 8 f-stops with half f-stop increments). While you hover with the cursor over the ZoneMapper zone ramp the ZoneFinder will display the areas in the image that have a luminosity of this zone. This way it is very easy to find the brightest elements in the image. In our sample photo the brightest elements are in zone 4. To make this zone brighter we would push the zone (actually most of the time zones 1 or 2 stops up) up towards the top. Then we do the same for the darkest area. It is important to understand that any of these control point (we used 5 here) is only influencing the tonal range between the control point above it (or the top) and the control point below (or the bottom). The best way to learn this is to download the free full working demo version of LightZone. So far you can do all this in all the other editors and RAW converters but we would say that using Curves is not as intuitive and Levels are not as flexible. With the upper and lower control points we protect the shadows and highlights from any changes. Again the ZoneFinder helps us to find the zones we want to change. In essence we only change the contrast in a small tonal range of this photo. No other RAW converter has such a feature and we find curves in Photoshop quite a bit harder to use for this purpose. 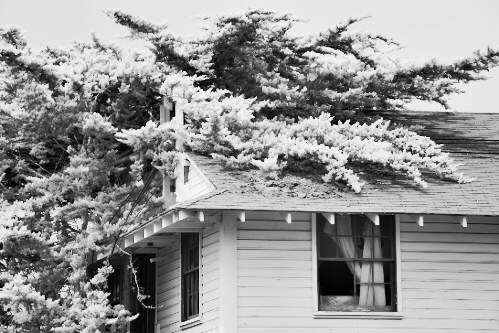 We often change the strong blue sky to a more grayish blue by simply desaturating the sky. But this needs to be done on the sky only. Traditionally only Photoshop would be our tool of choice. But with LZ's RegionMapper we can do the job right in LZ. We would like to brighten up the area at the bush. Because the regions have a feather range the transitions can be made very smooth. Actually this is one of the most important technique we use with LZ. We did the same with Photoshop layers before. It is actually the digital variant of dodge and burn in the traditional darkroom. What makes regions unique in LZ? What makes Photoshop layer masks unique? What if you like your current RAW converter better? As said LightZone is by no means a dedicated RAW converter. 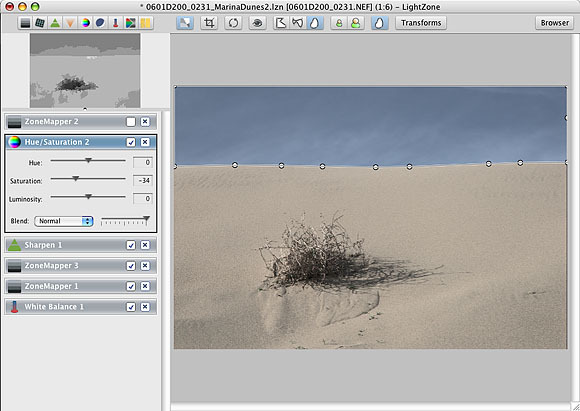 You can convert your images in any RAW converter you like into 16 bit TIFF files and then tune the images in LightZone. LZ is fully color managed. I uses internally a linear color space and works in 16 bit. LZ saves all changes in small .LZN settings files (200kb is already a large one and most of this is just the thumbnail for the browser). You can save as many settings files per image as you like. As mentioned this is a version 1.1 of a new product. We just mention a few features that are also on the list of the developers. 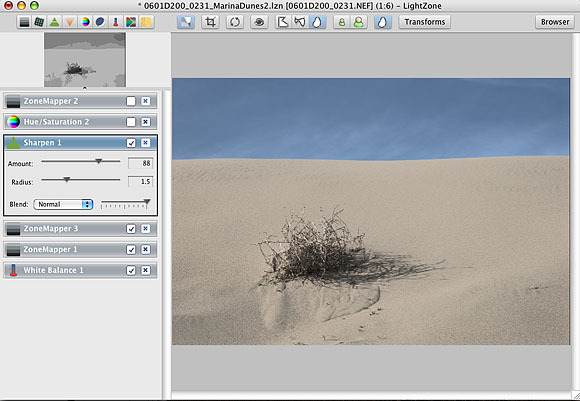 LightZone is a simple yet powerful image editor. LightZone is easy to learn and let's you focus on your images. We will follow the development of this editor very closely because we see a great potential using LightZone. 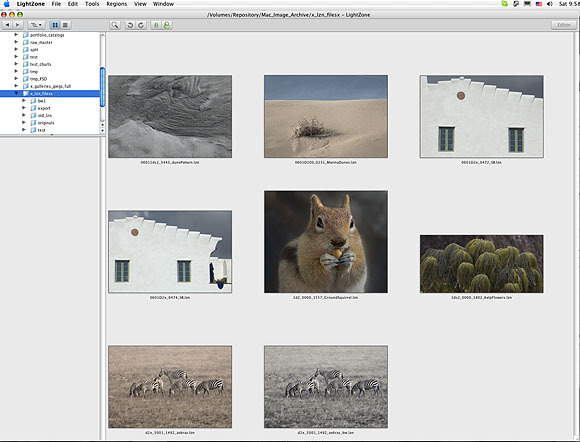 For advanced users LightZone provides a powerful photographic tool to optimize photos. Be aware that LightZone works differently than other editors. This will require some time to master. Try to experiment with selective operations in regions because here LZ can make a difference. Get a trial version and check it out (always try before you buy). Who is Fabio? Fabio is the the founder and key architect of LightZone. He intends to share his more personal view on LightZone in this blog. Of course Fabio is subjective about his "baby" LightZone but at least he shares his own passionate view on editing images in the digital world. I had quite a few discussions with Fabio over the past 3 months. Fabio listens to new requirements and other's opinions. Incorperating these ideas into LightZone is then a whole other story :-). Fabio also participated in our contest. You can download the sample image for the contest and also Fabio's LZN file. This way you can experience yourself all the chanegs in LZ. 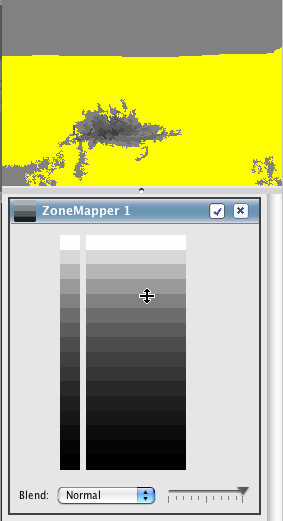 * The ZoneMapper can now alternatively work using RGB values. * Pentax raw files are now supported. * Improved default raw adjustments for some Canon and Nikon raw files. "LightZone RT works in conjunction with other image browsers and raw converters (such as Aperture, Lightroom, Bibble, Raw Developer and Capture One) seamlessly integrating the LightZone paradigm with your established workflow." LightZone RT is missing the raw raw converter and browser of the full LightZone application. We use LZ RT as a final step to perform selective corrections for TIFF files. Check out their documentation to better understand the workflow model. LightZone Retouch Edition (RT) 1.0 is now for sale at the special DOP price of $89.99 (use button below). There are lots of improvements in LightZone compared to 1.5 (and even more if you go back to 1.3). Note: For about a month we use LightZone as our main RAW and editor tool and we get more impressed by the day. You may have read our praise for Akvis Enhancer which improves the local contrast/detail in images. 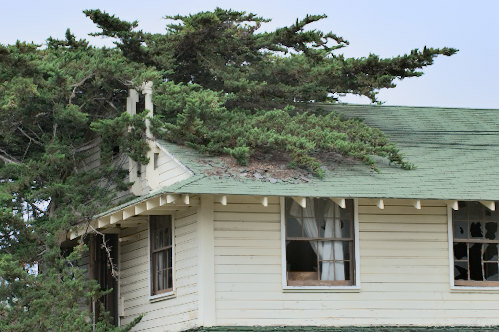 We think Enhancer is a must have tool for your work in Photoshop. The new ToneMapper in LightZone 1.6 is at least as good if not even more flexible. If "Detail" is set to zero the ToneMapper is the same as the already very good contrast masking implemented in previous versions of LightZone. You owe it to yourself to experience what the "Detail" feature can do for you. It brings the image to life and we use a ToneMapper nearly on every image. You can control the brightness of your image using the Gamma slider if the detail tool darkens the image too much. Versions of LightZone prior to 1.6 had only a simple color noise smoothening tool. 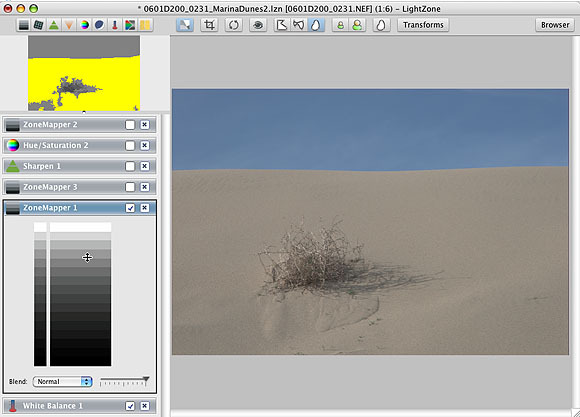 The new version allows to control color and grain (luminance) noise. This does not sound that new but we think that LightZone does an excellent job in protecting detail edges and avoid color bleeding at color transitions. We anyway recommend to be very conservative using noise reduction. There is not much danger to use higher values for color noise but the settings for the luminance should be used carefully. Maybe other noise removal tools remove the noise but often give the image a plastic look. Especially with printing you should not be that nervous about some noise. 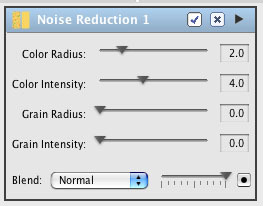 With the new Noise Reduction in LightZone you will rarely if ever need to use an external noise removal tool. Nikon D80 (update will be available about 9/9/2006). You should clearly update to 1.6 if you own LightZone. If you have not tried LightZone before then now is the time. LightZone may not have a very fancy user interface but the handling is very well thought out. LightZone has become a full fledged top photo editor in not even one year. You can also rest assured that LightCrafts is constantly working to improve this very innovative software. We help LightCrafts to focus on new and important tools.